The above hoarfrosted leaf was captured handheld (1/25 sec, f/2.8, ISO 100) between very strong wind gusts at the top of Cadillac Mountain (Maine). The 100 L was mounted to a Canon EOS 5D Mark II. That Canon introduced a new macro lens in the second half of 2009 was no surprise - A prior press release announcing the new HIS (Hybrid Image Stabilization) set our expectations for such an announcement. What surprised me was that it was a 100mm lens. The current-at-review-time Canon EF 100mm f/2.8 USM non-IS Macro Lens was already a great lens with fast AF and excellent image quality. The Canon EF 180mm f/3.5L USM Macro Lens, while it has great build and image quality, could really use a new AF system - and IS would be especially helpful at this longer focal length. Alas, Canon has delivered us another 100mm macro lens. My less-enthusiastic-than-they-should-have-been expectations were lifted by the fact that this was an L lens. And, the Canon MTF chart (the higher the lines, the better the expected image quality) was looking great. I don't regularly include Canon's theoretical MTF charts in the reviews, but this one is drool-worthy. This lens promised to be extremely sharp even wide open. The estimated street price was not bad for a 2009-era L lens either. What I first noticed upon taking the Canon EF 100mm f/2.8L IS USM Macro Lens out of the box was that the body was not made of the normal-for-an-L-lens metal. "The official reply from Tokyo is as follows: The focus ring, lens mount and name plate are made from aluminum, and other parts are basically made with engineering plastic." (Chuck Westfall, Canon USA) Engineering plastic is the good stuff. So, the 100 IS macro lens does not have that cold, hard feel, but it feels solid nonetheless. The attractive finish helps with the quality feel. Obvious from the above images, this lens does not move with focusing (and filters do not turn). When focusing at the very close MFD (Minimum Focus Distance) of a macro lens, this is a great feature. You are not bumping the lens into the subject by adjusting focus. The second thing I noticed upon taking the 100 L out of the box was the textured Canon ET-73 lens hood. Canon's smooth, shiny hoods have long been scratch and fingerprint magnets. Keeping them looking pristine is near impossible for any lens that gets much use. This finish is definitely more scratch resistant - or scratch hiding at least. I think it looks better - I like it. What isn't new is the old standard Canon side-pinch-only lens cap. Canon really needs to update this design to the center-and-side-pinch caps used by most competitors. The long, narrow installed hood (included) makes it very difficult for me to access the lens cap. Adjusting a circular polarizer inside the hood is nearly impossible as your hand completely blocks the light. On the other hand (and more importantly), because of its shape, the lens hood is very protective and very useful for this lens. Especially at short macro subject working distances - though the lens hood is easy to bump or scare the subject with at these short distances. If you don't like the hood, you can always remove it. Review a size/weight comparison chart below. Though it gained IS, weather sealing and L-designation over the non-IS 100mm macro lens, the 100 L IS macro gained almost no size or weight. This is an easy-to-use and easy-to-take-with-you size and weight. The Canon EF 100mm f/2.8L IS USM Macro Lens' AF is powered by Canon's excellent Ring USM (Ultrasonic Motor). AF is internal, fast, quiet and accurate (the original 100 macro was very similar in this regard). FTM (Full Time manual) focusing is provided. The focus ring is nicely placed and sized - and is very smooth with no play (even smoother with less play than the original EF 100mm macro). I find the flush-mounted focus ring to be especially useful when fine-tuning manual focus. I can let part of my fingers drag to the side of the ring (on the barrel) to add a variable amount of damping to the movement. An AF limiter switch is provided. The available settings are 1' - 1.6' (.3m - .5m), 1.6' - 8 (.5m - 8) and 1' - 8 (.3m - 8). 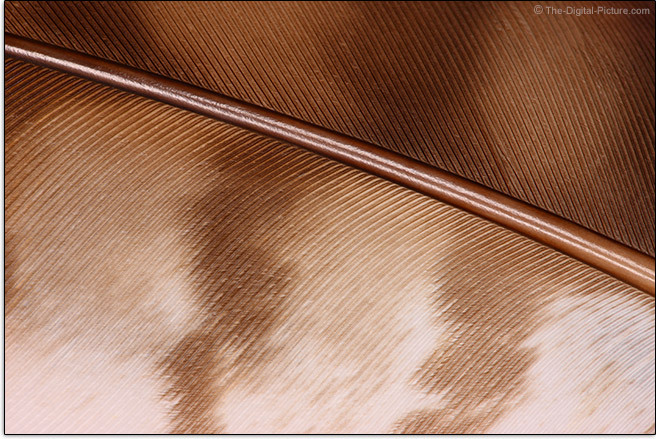 When shooting at macro distances, manual focus will often work best. Set the focus distance as desired and slowly move the camera forward or backward until the subject is properly focused. 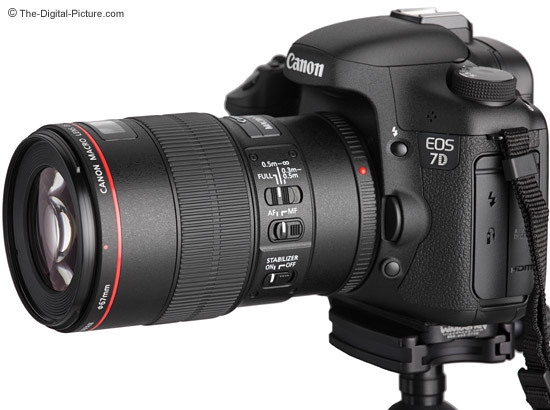 The 100 L is shown mounted to a Canon EOS 7D above. Any shortcomings to my less-enthusiastic-than-they-should-have-been expectations were quickly removed after actually using the 100 L. It's hard to put this one down - and it definitely makes me (my photos I mean) look good. 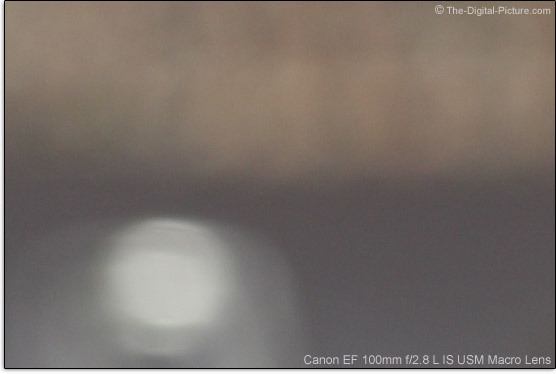 To start with, the Canon EF 100mm f/2.8L IS USM Macro Lens is sharp wide open - right into the corners. By f/4, full frame users will see the 2-stops of corner vignetting disappear and all will see even slightly sharper results. At f/5.6, full frame body shooters will see another very slight improvement in the corner of the frame. Color and contrast are great. Bokeh is excellent - the Canon EF 100mm f/2.8L IS USM Macro Lens creates a very high quality foreground/background blur. OOF (Out of Focus) highlights are rendered very smoothly. The original EF 100mm Macro Lens also had good bokeh, but the 100 IS L has an even stronger foreground/background blur as can be seen in the f/8 comparison below. The subjects are a paper clip and some fabric. Both lenses were mounted to a stationary, tripod-mounted Canon EOS-1Ds Mark III and accurately focused at an identical (short) focus distance. The 100 L has a little CA (Chromatic Aberration) visible in full frame corners. Very slight pincushion distortion is present - nothing to be concerned about for all but the most critical work. These two relatively minor issues represent the biggest negative image quality differences between the 100 L Macro IS and the Canon EF 100mm f/2.8 USM non-IS Macro Lens. These two lenses are more equal than different in terms of image quality - both are great. Some flare can be seen in 100 L images with strong back lighting. Use the site's flare tool to directly compare the 100 L IS Macro to the 100 Macro in this regard. The above comparison images were taken from a fixed camera position. You will notice that the IS L macro lens frames slightly tighter than the older macro lens. Great image quality will only take you so far. 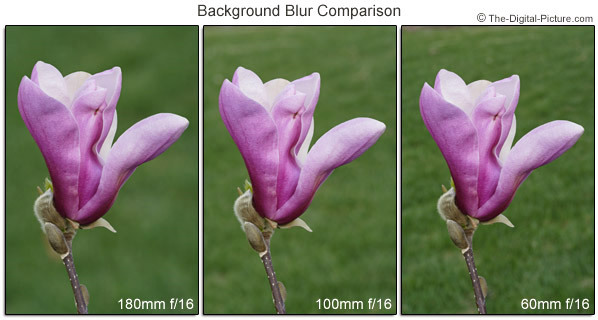 If the camera is not steady for the shot, motion blur will destroy image sharpness. 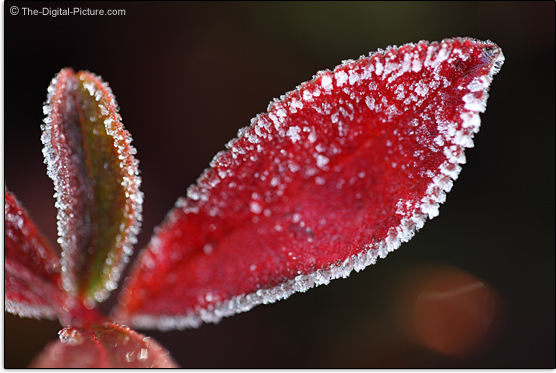 F/2.8 is a relatively fast/wide aperture and 100mm is a short telephoto focal length. This means a 100mm f/2.8 lens can be handheld in a lot of situations. However, move in close and things change. AE (Auto Exposure) will automatically adjust for this aperture change, but a longer shutter speed is the result. And when you move in close, DOF (Depth of Field) becomes very shallow at wide apertures. At macro distances, DOF becomes shallow at even narrow apertures. Proper camera alignment must be carefully selected to place the plane of focus on the proper parts of the subject (such as the wings of a butterfly) even at f/8 and f/11 when near 1x magnification. Non-stabilized shot setup is not easy. Enter HIS - Hybrid Image Stabilization - adding another dimension of stabilization over conventional IS. Hybrid IS adds correction for shift movement to the conventional angular correction as the graphic below depicts. The above image stabilization examples were captured in RAW format using an EOS 5D Mark II and processed in Canon's DPP. The Standard Picture Style was used with the sharpness setting reduced to "1" (very low). Bump the sharpness setting to 2 or 3 and even the .4 second sample is very usable. IS is not as effective at macro distances. Canon rates this IS system for 3 stops of assistance at .5x/2:1 and 2 stops of assistance at 1x/1:1. Testing IS completely handheld at 1x/1:1 is not easy - it is very hard to even keep the subject in focus when shooting completely freehand at this short distance. That said, at 1x with IS on, I get a good keeper rate at a shutter speed of 1/30 second and a few at 1/15. That is close to two stops for me. One of the big advantages of IS is that it is easier to frame the shot. The jittery-ness of the viewfinder goes away and you have a still view of your subject. This is especially helpful for tight framing of close subjects. Many ask about the sound made by IS. This IS implementation makes a click when it starts and again when it stops. How much noise it makes during operation depends on how much motion the lens is trying to correct. If stationary, a quiet hum with a some quiet clicks can be heard if your ear is near the lens. Move the lens around and IS whirs and clicks more significantly. The sound is definitely not offensive to me. Just because you can shoot at these long shutter speeds doesn't mean you should. IS does not keep your subject still. People move. Bugs crawl. The wind blows. Or, use the motion blur for effect in the image. Flowing water and blowing leaves may be what it takes to make that average shot into an above-average shot. IS is there when you need it. And I find that IS makes this lens much more fun usable. IS does not replace a tripod for all purposes. And an adequate, properly-used tripod can replace IS in many situations. The 100 L macro lens is designed to accept an optional Canon Tripod Ring D (not available at review time). I expect this to be a very useful accessory - for both tripod mounting and for mounting accessories to the lens itself (like a macro flash bracket). 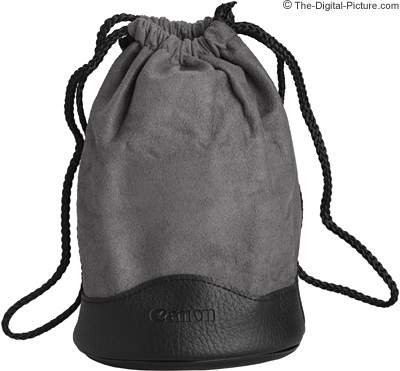 Those using the Canon Macro Ring-Lite MR-14EX Flash or Canon Macro Twin-Lite MT-24EX Flash will need to get the Canon 67 Macrolite Adapter (and a 58mm lens cap) for this lens. Buy the Canon EF 100mm f/2.8L IS USM Macro Lens and a genuine Canon LP1219 Lens Case (shown above with an EF 100mm f/2.8L IS Lens inside) is yours. Choosing a macro lens, like choosing any lens, means getting the right focal length for your needs. The 100mm focal length is one I highly recommend. The pictures above were taken with three macro lenses (180mm L, 100mm non-IS and 60mm). They are identically framed using the same camera, the same aperture setting (f/16) and they have identical subject to background distances. DOF (Depth of Field) is not different (same framing, same aperture = same DOF until closer to the hyper-focal distance), but perspective / compression / angle of view are very different. The 180mm lens shows only a small physical area of the subject's background that is enlarged - magnifying the blur. Background subjects in the 60mm picture appear to be more in focus. They are not - they are just about as blurred, but they appear much smaller in the picture - and there are more of them because of the 60mm's angle of view. This yields a less diffusely-blurred background. If you are using a backdrop (such as rolled paper), the background blur aspect will probably not be important to you. The 100mm focal length macro lenses offer a medium working distance, a relatively small size/light weight and a moderate amount of background blur. Another reason for choosing a macro lens focal length and another very strong reason to choose a 100mm lens is that you have another use for the same focal length. A 100mm macro lens with a relatively wide aperture, superb image quality, fast AF and an impressive IS implementation has a huge number of uses in addition to macro photography - including portraits, landscapes and indoor sports. Additional uses make it easier to justify the purchase cost of the lens - and the space it takes in the bag. 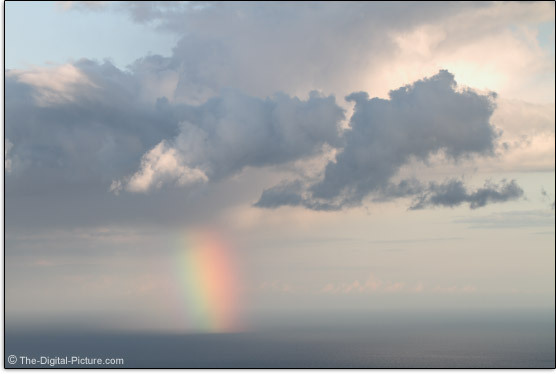 The above rainbow moving over the ocean was captured using the 100 L and a 5D Mark II. The 100mm focal length sits nicely above the typical 18-55mm kit lens offered on many Canon DSLR Cameras, making the 100 L a nice second lens for general purpose use with the addition of macro capabilities. Warning: when you see the image quality this lens delivers, you are going to replace your kit lens also. 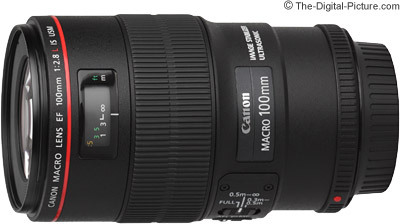 I called the Canon EF 100mm f/2.8 USM Macro Lens Canon's "Most fun per dollar lens". While that lens is less expensive, I'm thinking the Canon EF 100mm f/2.8L IS USM Macro Lens may be the new holder of this title. The improvements in this lens, especially the Hybrid IS, go a long way toward increasing the fun-ness. And the results are definitely fun-inducing. This is a highly recommended lens.